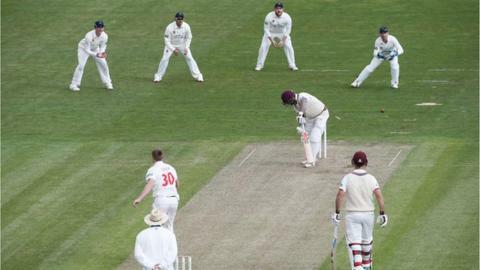 Glamorgan drew their three-day friendly against Somerset after being set 226 to win at the SSE Swalec Stadium in Cardiff. The home side lost early wickets but were given a chance by a fifth-wicket stand of 82 between Will Bragg (84) and Graham Wagg (34). The Welsh county finished on 195 for 7 with Tim Groenewald claiming three for 36. Earlier Somerset collapsed to 188 all out, with Wagg taking five for 50.